Beat Thang Virtual: the newest beat machine on the block. Beat Kangz has turned up at the Summer NAMM show, which starts today, with Beat Thang Virtual. 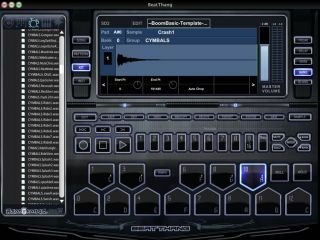 Beat Thang Virtual is being released as the Mac- and PC- based companion to the Beat Thang hardware groovebox's that set to start shipping in October. It costs £149, but anyone who buys it will get a money-off coupon for the same amount that can be redeemed if they then choose to purchase said hardware. Beat Thang Virtual can be ordered now on the Beat Kangz website.